Archive Blog | Who's afraid of Shen Yun? Overview: Why is the Communist Party Going After Shen Yun? Shen Yun’s mission is to revive the essence of 5,000 years of divinely inspired traditional Chinese culture, arts, and values, which have been largely destroyed in China under communist rule. In ancient times, China was known as the Land of the Divine. Everyone, from emperors to the common people, believed that their culture was a gift from heaven. They lived in harmony with the universe, believed in the oneness of heaven, earth, and humankind, and saw a connection among all things. People believed that good would be rewarded and evil would be punished, valued virtue in everything they did. Traditional Chinese culture embraced these principles for thousands of years. But the Chinese Communist Party (CCP) advocates struggle against nature and man. It sees this culture as a threat to its power, and for decades it has tried to destroy it, or sometimes co-opt it, and replace it with its own communist culture. It nearly succeeded. Today, although one can still find traces of traditional Chinese culture in mainland China, it is no longer mainstream and the underlying spiritual essence is mostly lost. Many consider today’s China as a country without a soul, a society with degenerated moral standards. The persecution of Falun Gong, a Buddha school qigong practice deeply rooted in traditions of spiritual self-cultivation, is yet another episode in Beijing’s ongoing war against traditional Chinese culture. Each Shen Yun show includes about 20 numbers, mostly depicting ancient legends and folk dances. In each performance, there are a couple of dance pieces that also depict the persecution of Falun Dafa in China. As Shen Yun revives traditional Chinese culture, Shen Yun artists also want to help audiences understand how traditional culture was destroyed, and to demonstrate the sacrifices of those who are reviving that lost culture today. While the persecution serves as context, what is typically highlighted in those two dance pieces is the power of the human spirit—compassion, courage, and desire for freedom in the face of adversity. Many audience members report finding these pieces especially touching and inspiring. This may not be surprising, as tales of the human spirit overcoming adversity have long been a favorite topic in art, film, and drama in the West. In one prominent example, the musical The Sound of Music features the von Trapp family’s escape to freedom from Nazi persecution. Despite Shen Yun’s international acclaim, Beijing has felt threatened by it for two reasons. 1. The CCP fears its persecution against Falun Gong will become more widely known. The regime has invested significant resources to prevent information about Falun Gong and the abuse suffered by practitioners—including deaths in custody—from reaching Chinese and international audiences. Academic and NGO studies consistently report Falun Gong being among the most censored topics in China and a common trigger for government reprisals against foreign media. 2. Shen Yun’s success undermines CCP efforts to legitimize its rule via a monopoly on Chinese culture. The Communist regime has been telling the Chinese people for years that there is no China without the Communist Party. So much so that they associate the Chinese government with the concept of China. Clearly this is false. China has thousands of years of history without communism. But the government has staked its legitimacy on Chinese people believing that it is the protector of Chinese culture. As part of that, China has been sending art troupes abroad to perform. These programs have been greatly outshined by the success of Shen Yun. Why do some Chinese fly to the United States to see Shen Yun? Because they cannot see it, or anything like it, in China. Shen Yun’s success outside of China demonstrates to Chinese people that the true essence of Chinese culture is not something the Communist Party can give them. One top art official in China even begrudgingly acknowledged the success and high caliber of Shen Yun’s performances, and accused the government of ruining Chinese culture. His comments were reported in a 2013 South China Morning Post article, titled, “State-funded arts troupes fail to shine against Falun Gong rivals abroad.” This makes it hard for the CCP to claim it is the guardian of Chinese civilization and the legitimate ruler of China. The CCP has tried every possible means to sabotage Shen Yun shows. This website has documented at least 70 incidents in 25 countries. The tactics used range from cyber-attacks against Shen Yun’s ticketing website, to hiring local thugs to slash Shen Yun’s bus tires, to mobilizing online commenters to post negative reviews about Shen Yun. They even organize people to pose as Falun Gong practitioners to send letters to theaters with delirious, nonsensical content in order to give the venues a negative impression of Shen Yun and Falun Gong. In January 2017, China Daily paid inserts in several major newspapers, including the Wall Street Journal, the Washington Post, the Telegraph in U.K., and Fairfax Media in Australia, all carried an article attacking Shen Yun. The CCP also uses economic interests to seduce or threaten foreign governments in an attempt to cancel Shen Yun’s performing contracts at state-owned or affiliated venues. This has occurred in Greece, South Korea, Ecuador, Thailand, Vietnam, Hong Kong, Russia, and Ukraine, causing significant financial losses to Shen Yun. Chinese embassies and consulates are also known to have harassed Shen Yun and pressured theaters not to sign a contract with Shen Yun or to cancel existing ones in many other countries, including Japan, France, Belgium, Spain, Germany, the Netherlands, Italy, Denmark, Sweden, Finland, England, Ireland, Scotland, Romania, Moldova, Czech, Australia, New Zealand, Canada and Malaysia, as well as in cities throughout the United States. In this context, Shen Yun has recently encountered difficulties securing the opportunity to perform at opera houses in some European countries. These opera houses, which are most suitable for the Shen Yun performances both in terms of their reputation and stage requirements, are all state-owned or affiliated. The Epoch Times: Washington Post: Arm of Beijing’s Grand Propaganda Strategy? In March 2018 Shen Yun performed in Israel for the first time. Leading up to the shows at the prestigious Tel Aviv Opera House, the Chinese embassy tried to cancel the performances and, when that failed, to limit Shen Yun’s advertising. According to a report in the London Guardian, the Royal Court Theatre canceled its production of Pah-La, a production about the stories of Tibetans in Dharmsala. Although the theater claimed the cancellation was due to financial reasons, it turns out the British Council had told the theater to stop the production because it jeopardized British-Chinese projects. Following the exposure, the theater issued a formal apology and announced its plans to put the play back on in 2019. According to a report in Danish media, the Chinese Embassy in Copenhagen asked the Royal Danish Theater to again not allow Shen Yun to perform there. The theater has refused to rent to Shen Yun for ten years. In a new form of propaganda, China Daily, the official English mouthpiece of the Chinese Communist Party, inserts paid ads that look like normal articles in newspapers around the world. The article title calls Shen Yun “A Blasphemy That Masquerades as Art” and, most disturbingly, appears to the undiscerning eye as a regular article written by the newspaper. Therefore, while it gives the normal party line attacking Shen Yun and Falun Gong, it appears to be written by the esteemed Washington Post, Wall Street Journal, or London Telegraph, to name just a few of the papers who carried this paid insert. Shen Yun was scheduled to perform in Thailand for the first time. Just days before the first performance at Bangkok’s Aksra Theatre, however, the theater canceled the show run. A letter from the Chinese embassy in Bangkok to the Thai Ministry of Foreign Affairs and Ministry of Culture threatened diplomatic fallout between China and Thailand should the performances be allowed to take place. 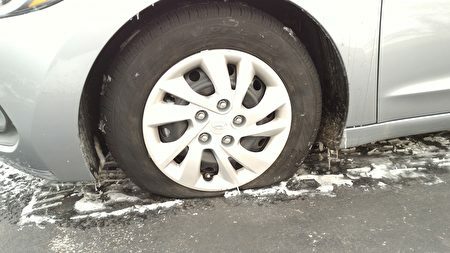 Prior to the Shen Yun performances at the Tennessee Performing Arts Center in Nashville, the tires of a car rented by staff members of Shen Yun’s hosting organization were slashed. The incident occurred between the evening of Jan. 5 and the morning of the 6. 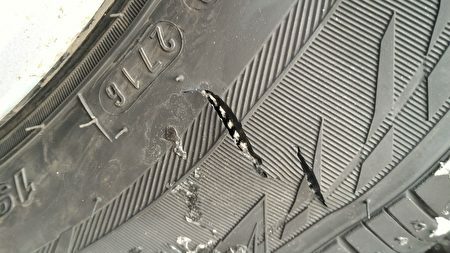 Several slashes were visible on two of the tires. 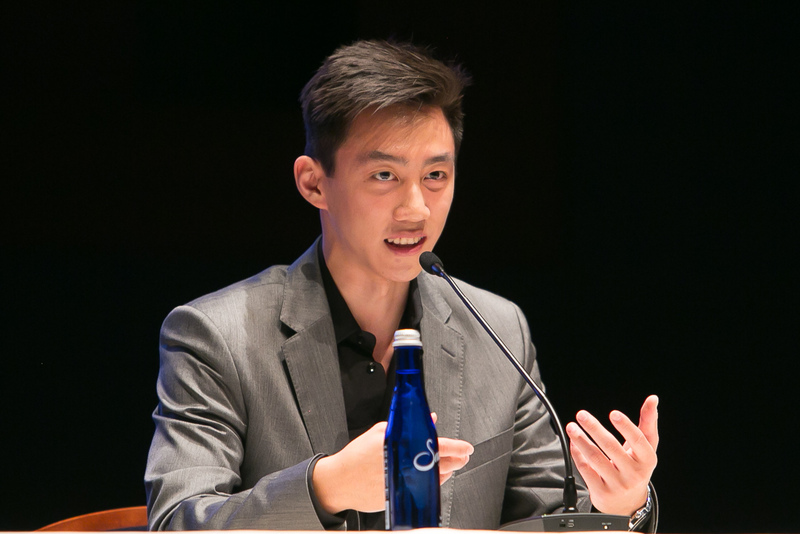 Two weeks after the conclusion of Shen Yun’s 2016 world tour, principal dancers Tony Xue and Rocky Liao, as well as myself, were invited to Washington, DC to speak at a panel marking 50 years since the start of the Cultural Revolution in China. 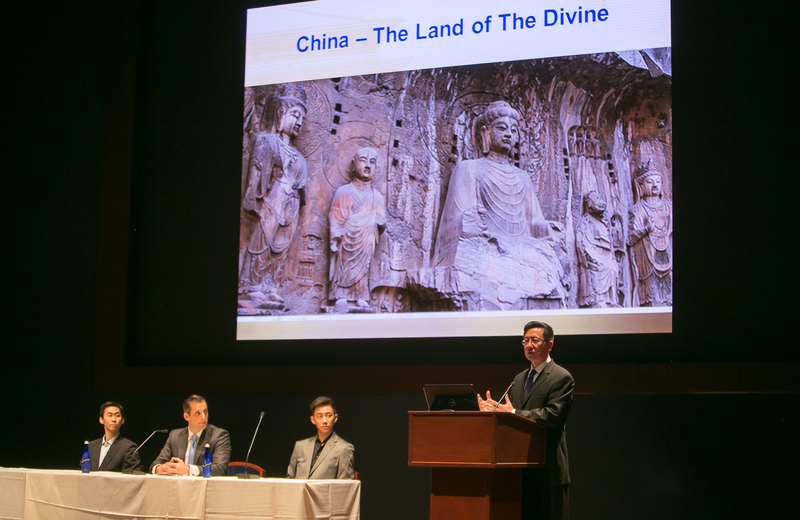 The panel, held on Capitol Hill, discussed how traditional Chinese culture has been destroyed, most notably during Mao Zedong’s Cultural Revolution (1966-1976), how this culture is now being revived by Shen Yun Performing Arts, and how this renaissance could only be started outside of mainland China. TV anchor Xiang Dong (right) moderated the panel. 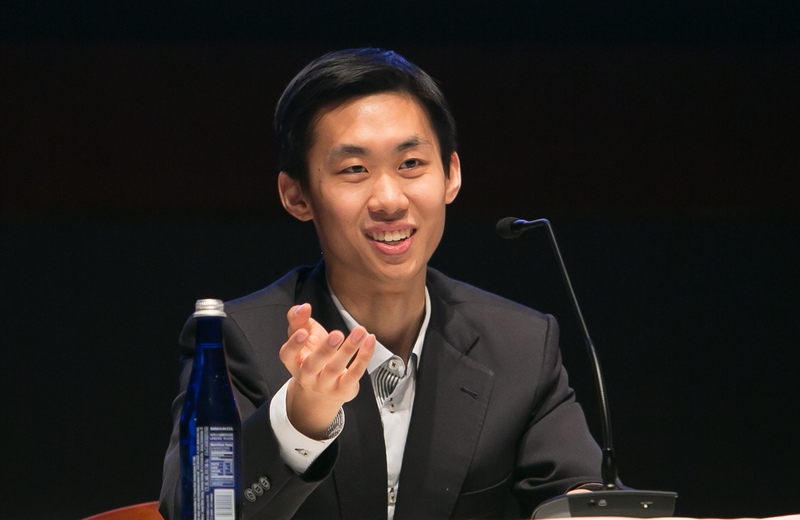 Tony Xue (above) told of his journey to becoming a Shen Yun principal dancer and the fulfillment he has found reconnecting with his own heritage. And Principal Dancer Rocky Liao (below) gave a glimpse of the behind-the-scenes trials and hardships of a professional dancer, what it takes to overcome them, and why it’s all worth it. 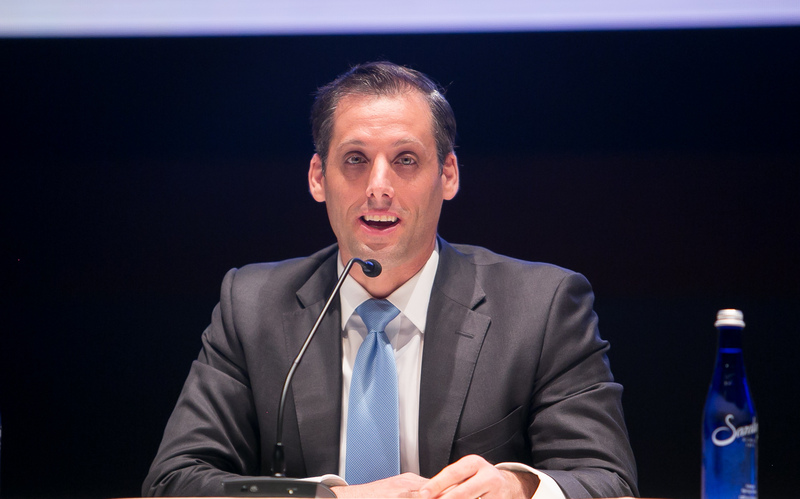 I gave a brief introduction to Shen Yun’s history, the incident in South Korea last month, why the Chinese Communist Party fears Shen Yun, and how it hasn’t slowed down the company. My bottom line was that Shen Yun, and the revival of traditional culture, is not just Chinese issues. We are a U.S., New York-based company facing interference, harassment, intimidation, and direct sabotage from a foreign government and its secret operatives. It is happening in America, from big cities to small-town USA, and it is happening to us when we travel internationally as an American company overseas. Shen Yun, as an ethnic-Chinese company based in New York, represents all that is wonderful and complex about the United States, and needs our protection and support. We were just wrapping up our performances in Ulsan, South Korea on May 4, 2016. Then, as we started packing for our travel to Seoul for performances there two days later, our company manager suddenly told us the performances at the prestigious KBS Hall had just been cancelled that afternoon. With a holiday weekend upon us, there was nothing we could do and no one we could speak to. Apparently, the cancellation came from a South Korean district court, whose judge issued an order canceling the upcoming four performances. The ruling cited threats from the Chinese embassy that Korea Broadcasting System (KBS), the owner of the theater, would incur financial losses in the Chinese market if the Shen Yun shows were allowed to go on.